Description: Lots of EMD leading this freight. Description: This set of Geeps continues around the bend. 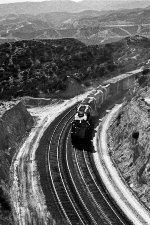 Description: Just about at Summit, the "Double Train" comes around the final curve. Description: Lead units cresting the top of the 2.2% grade.